Learn how to explore the areas surrounding a Dominos Pizza store, getting key insights such as total population, total households, and car-less households. NYC blocks (nyc_blocks): download from here as csv file. Dominos data (dominos_data): download from here as csv file. First, import nyc_blocks into CARTO, drag and dropping the file into the Builder dashboard. Select both datasets and click on CREATE MAP. Just after clicking on CREATE MAP, the Builder main menu will open up. The Builder user interface (already on LAYERS pane) will show four layers (Positron labels, dominos_data, nyc_blocks and Positron), the first and last of which correspond with the basemap, the other two are proper data layers. Rename the map as Dominos Pizza Demo and the two layers as Pizza Stores and NYC blocks respectively. Change to a basemap without labels. Each layer (but the basemap) has a dataset as the layer source and a node id. For instance, the source of Pizza Stores is dominos_data, with A0 as node id. This will be very important when adding analysis and widgets. Click on NYC blocks layer. This tab gives a general idea of each field/column in the layer, its name, and its data type. We could also add them as widgets from here. Click the slider button from VALUES to SQL. The SQL view allows more advanced users to manage data using SQL language. Finally, it’s easy to change from Map view to Data view by clicking on the button at the bottom right corner. FILL: click on the FILL color, select BY VALUE, set total_pop as the variable and choose a nice color scheme. Change the STROKE to 0.2. Click the slider button from VALUES to CARTOCSS. The CartoCSS view allows more advanced users to style the layer in a more precise way. Back in the main menu, click on ADD ANALYSIS on the Pizza Stores layer. Select Create Travel/Distance Buffers. Click on ADD ANALYSIS. Set DISTANCE to km and RADIUS to 1. Hit APPLY. An explanatory pop up will appear. Click on DONE. Add another Analysis to the Analysis Chain by clicking the plus symbol (+) in Your workflow. Select Enrich from Data Observatory. Click on ADD ANALYSIS. The Data Observatory enrichment is the result of the geometry location and the measure requested. Set NEW COL. NAME to population. Select United States as COUNTRY, Age and Gender as MEASUREMENT and Total Population as SEGMENTS. Click APPLY. total_households, United States, Housing and Households. 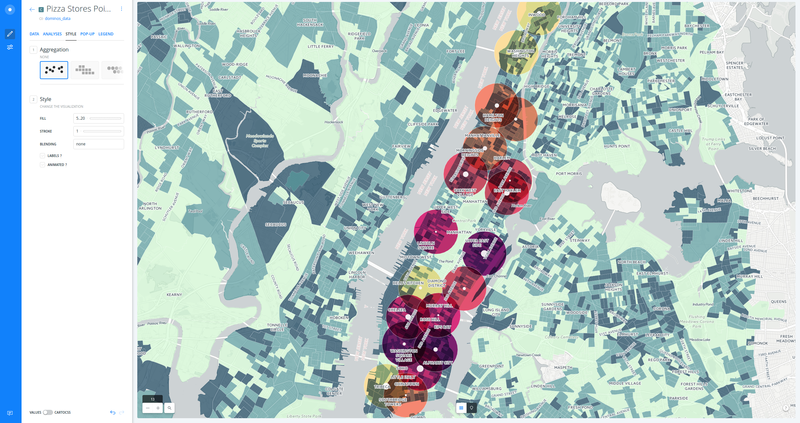 carless_households, United States, Transportation and Car-free households. Warning: if the buffers are not showing right on the map, refresh! 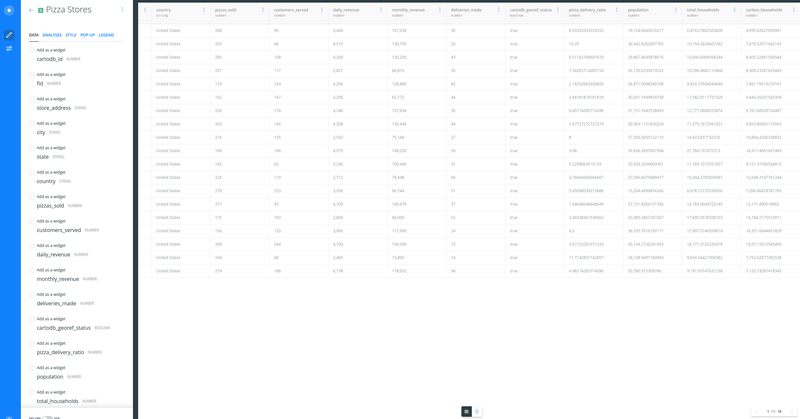 Go to the Data View in order to see the new three fields the analysis have created. 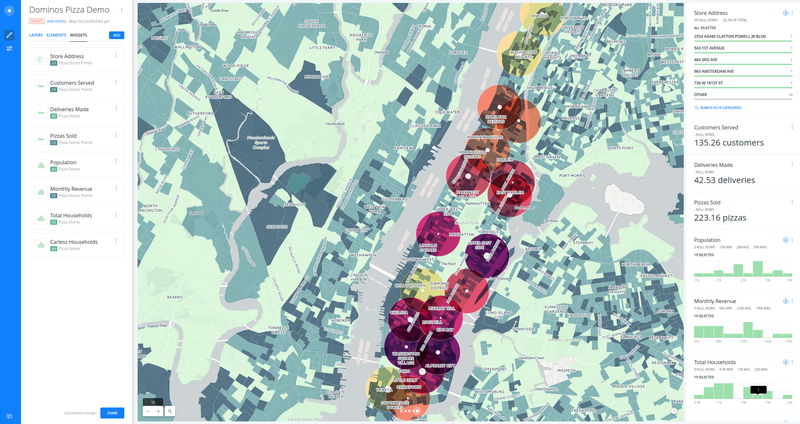 FILL: click on the FILL color, select BY VALUE, set carless_households as the variable and choose a nice color scheme with some contrast to the one used for NYC blocks layer. Set the number of buckets to 5. Click on LAYERS, ADD a third layer, again select the dominos_data dataset and rename it as Pizza Stores Points. STYLE this new layer, set the marker width according to monthly_revenue value, select a color (white would be a good choice) and set the STROKE to 0.2.
and one HISTOGRAM widget for monthly_revenue. From the Pizza Stores layer (should be node A0). Three HISTOGRAM widgets for population, total_household and carless_households. Tip 1: for widgets that have values with units, such as monthly_revenue (a dollar amount), you may add a Prefix to the widget, in this case a $ symbol. Use the filters according to an invented target (for instance, stores with lower monthly revenue but closer to households without cars).